Never Enough Nails: More Lynnderella Obsessions!!! Lynnderella is re-opening her Early Halloween shop tonight at 7pm. 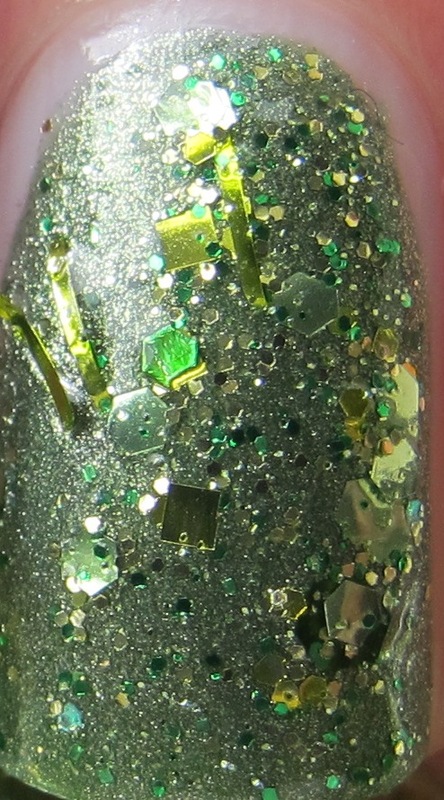 I want you to be prepared, so I am showing you two more Lynnderella Early Halloween polishes this morning. First up is the amazing She Lived in a Swamp. 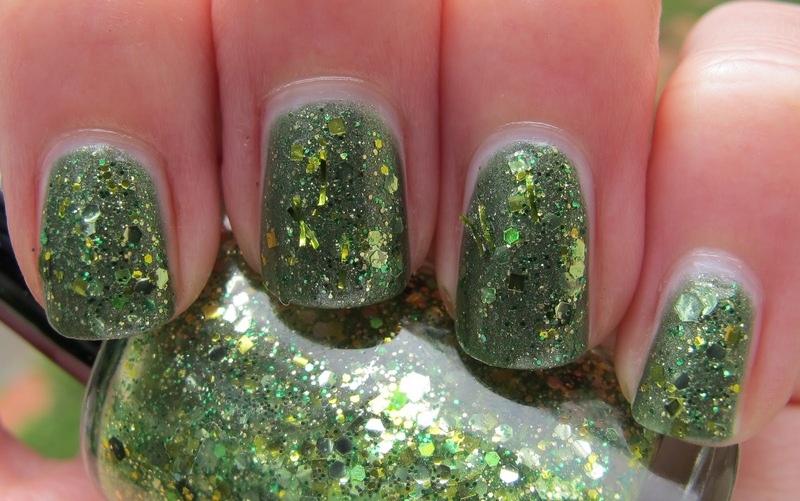 This is two coats of She Lived in a Swamp over Rimmel Lasting Finish Pro Rags to Riches. 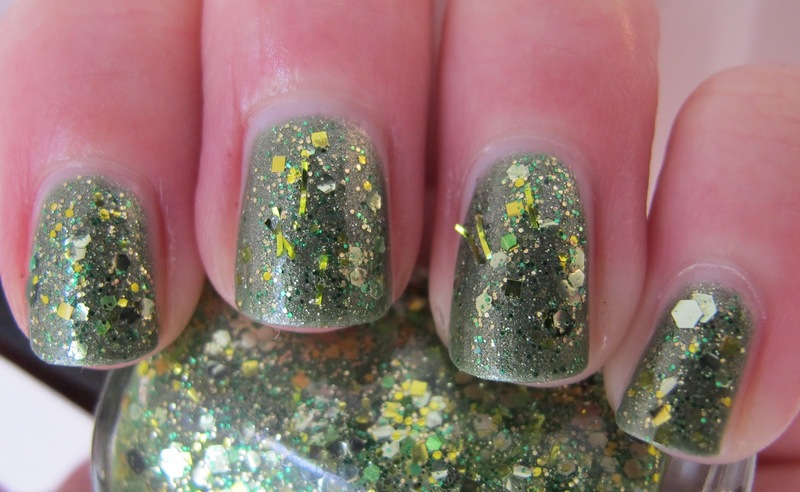 She Lived in a Swamp is a mix of many different green and yellow-green glitters in a clear base. I can't really name every glitter in this polish, but a few of the highlights include: grass green hex glitter, military green hex glitter, yellow-green bar/string glitter, small grass green glitter, and yellow-green square glitter. Click on the picture below and try to find them all!! The insane amount of different glitters in Lynnderella's polishes is really what draws me to them. 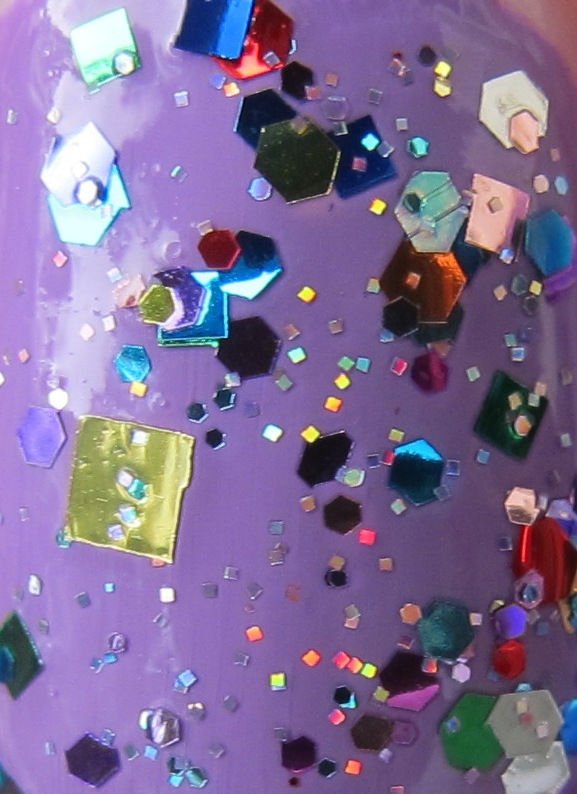 No other polish company/brand includes this many different kinds of glitter in their polish. I love the unique look this provides, especially when the glitter is layered over a similar base color. Next up is The Glittering Crowd. 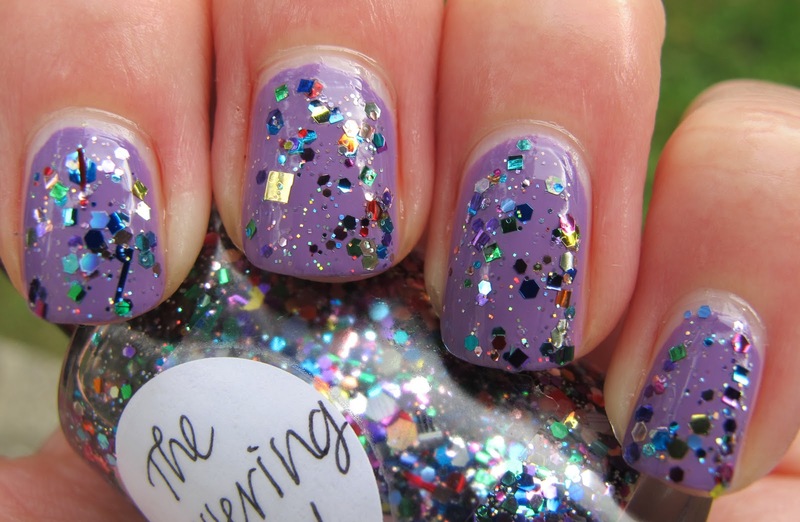 The Glittering Crowd is a serious pile of different kinds of glitter in all different colors, set in a clear base. 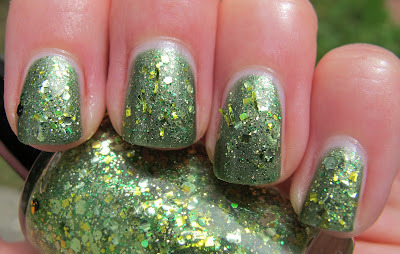 I think I read that Lynnderella used more than 50 different glitters for this polish, and I believe it. 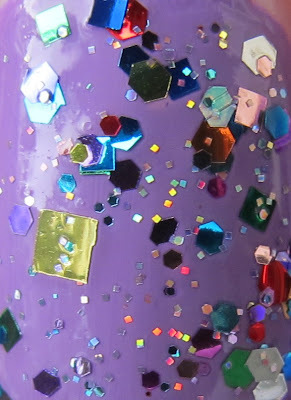 I can't possibly name all of the glitters, but I'll give you a small sample: medium square blue glitter, large square gold glitter, fine silver glitter, small circle blue glitter, small square green glitter, medium hex gold glitter, medium purple hex glittter, and medium silver hex glitter. And that's really just a few pieces I could find on one nail! 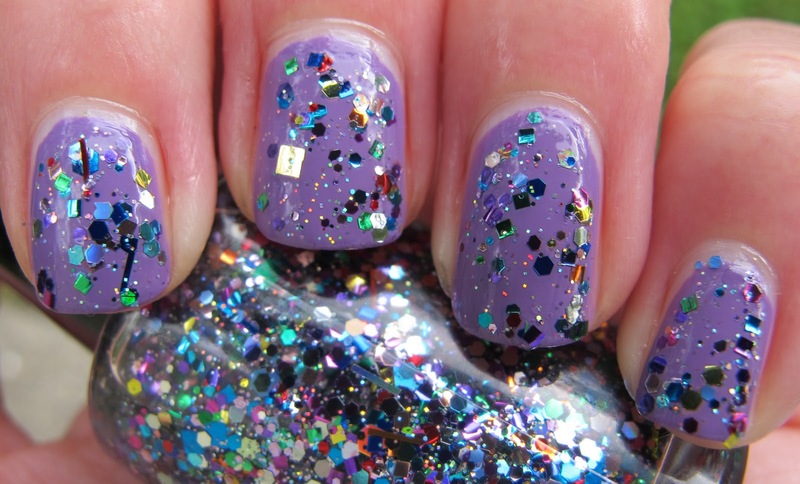 I did three coats of The Glittering Crowd over two coats of Rimmel Wild Orchid (pics and review tomorrow) in all of these pictures. 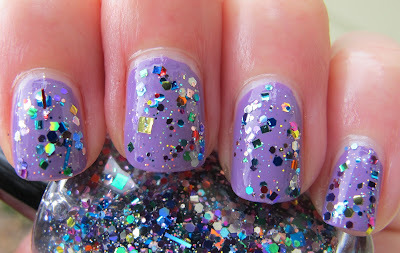 The Glittering Crowd would look fantastic over any color polish, due to it's rainbow appearance. It would really pop over black, but I also can't wait to try it over red. 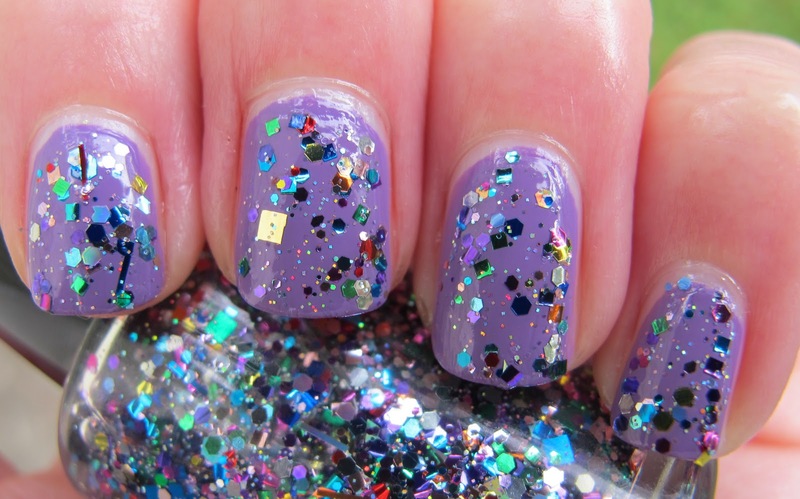 Lynnderella's shop will open tonight at 7pm, and I suggest you submit your order right at 7 if you're interested in any of the Early Halloween polishes. Check out my swatches of The Telltale Heart here. WOW! I don't know if I'm bold enough to try those out - but I love the way they look...TOO COOL! I love them too Cami! 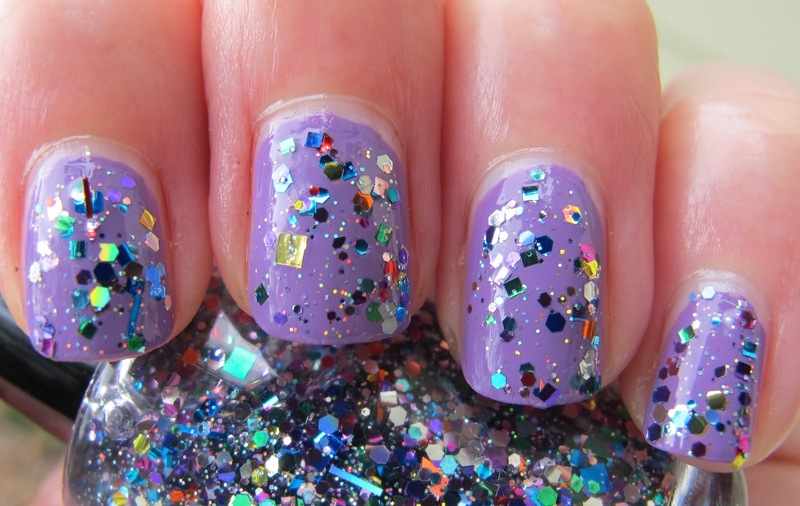 I think you could tone them down a bit by using only one coat of glitter, or using them for a jelly sandwich! I love that first one! Thank you so much for letting me know that orders are open today! I just tried to place an order! Imfeelingnail-venturous- I hope your order got in!! These polishes are such a treat!